The Firelands occupy the theoretical bottom of the "sphere" of the Elemental Plane. Just as the Skywall sits atop the plane, in a sort of bowl shape, the Firelands sit in the bottom of a similar curve. The "ground" underneath the surface is a sticky, bubbling mess of tar, ooze and rock fallen from Deepholm, which of course serves as the "sky." In some places, lakes of flammable oil and combustibles form, burning constantly and filling the air with superheated smoke. Organic and semi-organic material from Deepholm, and even the waters of the Abyssal Maw higher above, constantly filters down to provide new fuel for the endless flames. In places where the Fire Princes do battle with Therazane, huge volcanoes rise, spewing lava into the Firelands and upwards as well, sometimes reaching the floor of the Abyssal Maw or even the upper surface of Deepholm, where they blow noxious fumes into Al'Akir's realm. It will be introduced in Patch 4.2 as a raid instance with Ragnaros as the endboss. The loot will probably based on Tier 12, a step up from the loot acquired in early raid instances in Cataclysm like The Bastion of Twilight. Do not a few Hyjal quests also bring you to some very small areas located in the Firelands? Fun quests, as I remember ! Laggy, 3D, hard to control... Joust. On the plus side it's much harder to lose and there's a bunch of eggs in the back room for wave 3. Makes life slightly easier. And you get a prize for enduring it all. Not actually a new 5-man instance. Why is this here? So, how does one find this dungeon? One waits until the patch when it's implemented. This dungeon would be very disappointing if there was no fire to stand in. "That dude" you're referring to is Malfurion Stormrage, the most powerful druid in Azeroth and possibly the most powerful mortal ever. A possible new model for Ragnaros (which will obviously be the last boss of this.) has also been shown on mmo-champion. Click here to see it. But then again Iunno how much power he does have seeing as how Cho'Gall was about to sacrifice him to C'Thun. An elemental with arms? WTF is that? It has been recently updated by Blizzard that the Firelands will NOT be included in patch 4.1 but in patch 4.2. When exactly it will be released is not certain. This is not a raid. People need to stop calling it a raid. It is listed as a five man dungeon. READ THE INFO AT THE TOP BEFORE POSTING INCORRECT INFORMATION. What are you retarded? People are posting things about it being a raid because it IS A RAID. Its listed as a dungeon because blizzard is not finished with this. Its the new raid thats coming out in patch 4.2 And yes, i do mean 4.2 . The last boss is ragnaros and is going to drop some nice stuff. So please dont be rude to other people when thier right. Get your facts straght. Besides, it DID say he was gonna drop t12, and I'm pretty sure dungeons don't drop raid gear. The look of this place reminds me of something... some movie... i can not put my finger on it but i know it blows up. Star Wars perhaps? I must admit if I looked at this place i would say "that's no moon" yeah must be Star Wars. Blizzard has now released the official Patch 4.2 Firelands trailer on the World of Warcraft website. The video shows a few of the bosses that will be fought, along with many new models, and a look at the fantastic new zone. More likely to be a reference to anthracite, a kind of mineralized rock that burns very easily. How nice to see now Raggy have 2 short legs. You know, this raid is reminds me of the scourge. The bosses are just like northrend bosses and mobs. Staghelm is a nightelf and uses the nightelf model just like Prince Valanar, spider is just like a big crypt fiend, the phoenix bird is just a protodrake model, ragnaros is Kiljaedin from BC, Baleroc is a doomguard. It is like fighting the mobs in the Burning Crusade Expansion Mount Hyjal raid all over again. I mean really, a spider boss in a flame themed raid? There are much better models to use than a spider. You all are blinded by the lies of other people. Furion is one of the greatest villains in wow. First of all, he is the reason the scourge were still around up to wrath ( he stopped illidan's spell), he enabled the draenei to experience unmeasurable pain and suffering ( he let illidan go and enslave broken), he abandoned the blood elves and ended up almost letting Kil'jaedin reenter Azeroth ( in WCIII after furion runs away to save tyrande not even thinking twice about the blood elves that helped him save the scourge) and he also is a valuable asset to the old gods. What spell does he use to 'trap' staghelm when the latter imprisoned thrall? he used entangling roots. Would roots do any good to fire? It was all a setup. Furion is not a hero of azeroth but a criminal. Who knows, maybe he was conspiring with Xavius in the emerald dream. Maybe he will even unleash the old gods. Please play through Warcraft III and the WC3 expansion before down rating this. You will see Furion plotting his grand masterpiece. More evidence: Furion purposely puts the orc and human forces in front of his to ensure the death of Thrall and Jaina when the burning legion tries to take the world tree. In the frozen throne expansion, he even leaves Maiev and Tyrande alone to travel across the scourge infested plaguelands. Then he blames Maiev for Tyrande's "death". Furion is a selfish old man and should not be trusted by anyone. After he and Illidan part brothers again after Illidan saves Tyrande, he does nothing to stop Maiev from hunting and killing his brother. Furion simply used Illidan to get his lover back. Too soon...ahh, outsiders, this is not your realm! When I finish this, your pathetic mortal world will burn with my vengeance! you really dont follow this game do you.. Looking forward to kill kil'j.. oops i mean Ragnaros. Look out "You forgot about Thrall." Troll Detector is going of its nut ! You are undoubtedly the most Horde-aligned player I know. I like that. The flamewakers are among the most feared elemental guardians in the Firelands. Shannox is no exception. Serving as the chief hunter and kennel master of Ragnaros's hell hounds, Shannox patrols the elemental realm with his two most ferocious beasts: Riplimb and Rageface. I'm going to go with "no" on "Is Fandral Staghelm tameable while in cat form?" Fireland's bosses are a tough,doable. Yay, another person who has no idea what they're talking about. MC: Rag was banished, BANISHED, not killed. Edit: Lol, downrated for correct info. Gotta love Wowhead users. I have looked around, but I haven't been able to confirm: will you be able to mount up inside the raid instance? If so, I'll spend the cash on a Traveler's Mammoth. i didn't say i killed him before now did i^^ i just said i'm looking FORWARD to killing him, because of what i know is that you actualy can kill him in the firelands and not just banish him. Learntoraid.com already has 5 of the 7 Firelands boss guides available on their site. Along with the full previous tier of normal and heroic bosses (13/13) there is a lot to check out and discuss on the site and forums. Here is just one of the new videos of Firelands content featuring Alysrazor one of the first bosses of the zone. Furion obviously likes the horde more than the alliance. He put the human forces ahead of the orcs on mount hyjal. And in the in-game hyjal raid, the human town hall was all the way down in a ditch. What horrible planning. Just set a couple of meat wagons on the easily accessible high ground and annihilate the human forces below. Furion had planned this and wishes to wipe out all the races other than the night elves. He is the warcraft version of Kerrigan. He manipulates his "allies" into thinking he is working for the greater good but in the end, he back stabs them. Just like Kael was betrayed, Illidan, Thrall and so many others. Just watch, his plan has already succeeded in the most part. He has finally married his only love, Tyrande. Now he seeks to rid the world of the beings that oppose him so he can easily dispose of the remaining races afterword. You see he is allowing the night elves to go back to their old arcane ways. He "saves" both the worgen and draenei in order to bolster the alliance which is the major puppet in his grand schemes. I think you missed something. MALfurion (not just "Furion", when I saw that as many times as I did I wanted to punch a puppy) was unaware of who he was going against. He didn't know it was Staghelm. How could anyone? I hear hoods sure do keep identities hidden. And the bit with the roots, was again, before he knew who the perpetrator was. One can farm rep with Avengers of Hyjal on trash here, unconfirmed, but i believe trash gives rep to 5999/6000 friendly. how do you get there? like where is the portal or zone-in? i might not be able to ever raid in there but i like looking around in stealth after forming a raid with 1 other person. The entrance to the raid is on Mount Hyjal at the Throne of Flame at Sulfuron Spire. Is there going to be vent rages on Rag Kills like back in vinilla? hahah, i wish.. Anyone else notice how there is no dps plate shoulder drops in firelands? Wondering if Spaulders of Recurring Flame was maybe suppose to be the dps ones considering they have so much str and less sta then the other tank shoulders. omg It's Jim Carey's "do" from Ace Ventura, When Nature Calls. Though mostly dogs in WoW are able to see stealthed players none of the dogs or anyone else of the NPCs can see stealth. So actually Stealth Runs are possible. "For what?" may some of you ask? For fun! When I first entered the Firelands Raid I were feared some Daedra would show up behind the next corner. the Instance reminds me alot of Oblivion - The Elder Scrolls. Couldnt find anything about it so im posting it. You cant fish in the Firelands. Hmmm...where can I find the list of Firelands BoE drops ? A kill video with Vent of Rag 10. Blood DK Tank POV. As of patch 4.0.3a, Scorpoins and Pyrelords got a speed increase, and now they move at ~150% speed and can not be slowed. - The Hellhounds and Terrorpene's father can still be kited. The Avengers of Hyjal is the Faction associated with the Firelands raid. Gaining reputation with them is done by killing trash and bosses, which in turn allows you to purchase items at each reputation level, starting at Friendly. The rewards are Cloak (378) > Waist (378) > Trinket (378) > Ring (391) from Friendly to Exalted respectively. The Avengers of Hyjal vendors can be found right outside the Firelands entrance and right inside the Firelands. This is all the trash not mentioned under "Large" trash. These are Unstable Magma, Flame Archon, Flamewalker Animator, Flamewalker Subjugator, Molten Flamefather, Molten Lord, Lava Wielder, Molten Spewer and Molten Erupter and Kar the Everburning. Reputation gains are the same for 10 and 25 mans. I like the approach to the tier 12 armor sets. 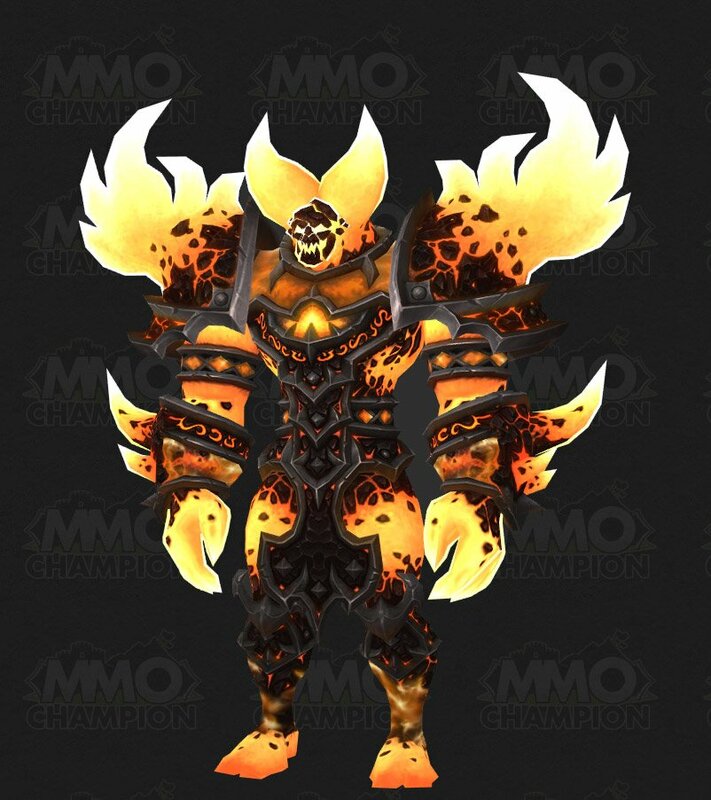 "Yo dawg, we heard you like Firelands, so we put fire on your armor so you can burn while you burn." Firelands has purposely lost all my motivation to raid this patch. The lack of spirit cloth and low chances of healing items dropping is close to never dropping. The only spirit cloth i can get is the random chance hat and hope that it'll provide spirit. I may get weapons and a trinket, but my armor progression will take the longest of all classes as a holy priest. We depend on spirit but forced to either waste high amounts of gold for tailoring crafts which cannot be upgraded to heroic, and spent more time saving up valor points. In the long run, priests has recieved the worst of this patch with little to no satifaction of accomplishment or usefulness. I wanted to post a comment to see how high I can get my comment rated up. Noted in the 4.2.2 Known Issues List (posted on the #Warcraft Bug Report Forum: (http://us.battle.net/wow/en/forum/topic/3082032335). In the Firelands subzone The Molten Flow lava textures are not displaying on the minimap. General: Don't waste your time with bad setups. We benched our resto shaman and dps warrior from the very beginning and had our feral dd respec to balance. It may be possible to beat the encounter with unusual setups, but given the time needed to learn it even with a nearly optimal setup (we had Pala/Warrior Tank, Pala/Druid Heal, 2 Moonkins, 1 Demo Warlock, 1 Arcane Mage, Hunter and Rogue), I would never even try it if I had any choice. Phase 1: If your DPS is decent (and it has to be, otherwise you won't manage P3) slow down on dpsing so that you can detonate a trap at 71/72 percent. This way you'll only have one trap in P1,5/P2 which just eases stuff. Phase 2: We optimized our complete setup for this phase, taking 2 Owlkins with us and only one melee. Our tactic was going together from one side to the other, spawning all of the adds in one point. Our warlock (me) and our arcane mage, however, started on the opposing side. This way, we could actually help bombing (you always have aggro of the add you spawned yourself) while the melee finished one of our adds, leaving one harmless add for the cleanup. This tactic changed P2 from nearly unmanageable to easy. Before P2.5 starts, bring the boss to 42%, wait for World in Flames, then dps him down as hard as you can without using crucial CDs (you'll need them in P3). This way, you can start P3 with 37% instead of 39%. Phase 2.5: Have one designated DD prepare an add for a later kill, we had a person to do this on both sides and they communicated who would prepare an add according to the hammer position and number of adds. This way, you can optimize the dps on the adds. With good spawn points, we occasionally started P3 without Scions. Phase 3: we had our hunter and healers take care of the meteors as much as possible to free up the dps, but I guess the main key to success is a good Phase 2.5 and the World-in-Flames-Trick at the end of P2. When we reached P4 rather consistently, we allowed trash talking during P1 and P2 (not during Submission Phases) to overcome the extreme boredom of the first 8 minutes of the fight until you finally reach the "hot" phase. This made the whole progression a lot funnier without causing any unneccessary wipes. This still has a lot of transmog, legendary quest, and rare mount potential. And thanks to brute force numbers and ilvls, we 6man-ed it on 10man normal in a reasonable amount of time with very casual players, with only one true tank and two healers. Still, if you don't know the tricks, it can get rough, so don't think you can go in without even reading up the bosses. Everyone on raid need to have Fireland access? Or we can just summon on stone? Can confirm that this raid is a breeze to solo at level 100 with 660 ilvl. Remain in Chakra: Chastise, spam smite and use Solace whenever the cooldown comes off (Solace will be your main heal). Reflective Shield deals a good chunk of damage too, so use it when it is also off cooldown. I wasn't able to kill some of the 25-man bosses and had to switch out to 10-man, typically as a result of mechanics or not enough dps, or both. And both Shadow and Discipline don't really work for soloing this place because of the nerf to Shadow's self-healing, and Discipline's lackluster DPS. Steer him to the volcanoes and avoid the edge. You can clear the smaller adds with PW:Shield and can Mind Sear if they're not dead yet. PW:Shield and Solace typically kills the larger adds. I'd pop Power Infusion and Shadowfiend once armor breaks, it's an easy fight. Kill one of the spiders that drops down, go up top and burn the boss, very easy fight. I didn't have enough dps to do this on 25-man because I couldn't kill Rageface quick enough before he used Face Rage on me, which is a wipe when soloing. Strat is simple: Kill Rageface as soon as possible, pop all cooldowns and burn him. Afterwards just down the boss and avoid traps. Easy fight on 25-Man. I got three feathers for the speed increase but didn't fly up. Kill the adds when they spawn and range the boss down throughout the fight. Avoiding the tornadoes of flame is easy: just follow one. I couldn't do enough dps on the 25-man version before he killed me, the 10-man version is easy, I'd just avoid the Shard of Torment and burn him down. Much like Baleroc, I couldn't do enough dps on the 25-man version before I was killed. Avoid the circles of fire and just burn the boss down, he dies fairly quickly. I didn't attempt it on 25-man, mostly out of laziness and wanting to go to sleep, but the 10-man version is easy. Kill the adds when they spawn and burn the boss down. For those who are working on the legendary quest like I was during this run, I obtained 236 Seething Cinders from running the above bosses/difficulty. Patch 6.0.2: Soloed this raid as enh shaman ilvl 564. For anyone wanting to try for the mounts in a post-stat squish environment: go for it. I'm a mainly TI geared iLvl 536 BM hunter (two tier pieces from the Celestials), no raiding experience, very average player and I've never been in Firelands before. Did all bosses on 10M normal with no issues and only one death, to some trash who did stacking fire damage (the two fire worms just before Ragnaros) which killed me right quick. Basically, I burned all bosses without worrying about strats or mechanics, just stayed out of the bad on the ground and on Shannox made sure to kill Rageface, then Riplimb, then Shannox. Ran with a spirit beast, but will swap to a shale spider next time for the damage reduction since I had to pop Last Stand and res my pet on Baleroc. Used glyph of animal bond, glyph of mending, glyph of misdirect and the spirit bond talent. Just wanted to drop some data. Finished normal 10 man pretty easy last week, so decided to try 10 man Heroic this week. Been doing 10m since 6.0.1 when i started the legendary questline. First few weeks on my Warlock i roflstomped it no prob. This week i noticed it seemed to take decidedly longer and even wiped on Rag once. Is it just me or did locks either get a nerf or did firelands get a buff? Or did the adjust the legacy content buff? Solo farming this on heroic 10 man post 6.0.2 is very doable, however it might require some gear. I've been farming this on 10man hc on my warrior since the patch and it is not difficult for me at all, at ilvl 581. However some bosses will be a problem for lesser geared folks. Beth'ilac - You need to kill one of the hanging spider adds quick and get up before they start stunning you. Once you are up you must kill her before going down. If you go down you will be permanently stun-locked by the adds. Ragnaros - All about managing the adds. Keep them from hitting the hammer during his down phases. I've gotten 2 hammers and 2 sets of adds at the same time, this is no fun. The hammer can also be invisible, but you will still see the glow effect. This is the only real issue in this fight. Baleroc - Blow everything on pull, soon as first shard gets dropped blink it and continue nuking, your elemental will mostly likely be either dead or close, resummon and blink the second shard, he should die about now, otherwise you are screwed. Fandral Staghelm - By far the hardest of the instance for this i recommend going cold snap, icy nova, mirror images and thermal void also you NEED glyph of regenrative ice. Start the fight off with water jet and mirror images, after he kills the first blow everything you have and nuke as hard as possible, save icy novas for whenever he gets 2-3 spirits up and clear them with one hit, every time he uses leap of flame (which will be every 2-3 seconds after about 40 seconds of the fight) move OUT, the damage may not seem like much but you cant afford to take a simple point of unnescesary damage. You will have to resummon your elemental at one point and you will also get another round of images off, use ice blocks / cold snap for heals as needed, i also had to pop a tonic. Enjoy phat lewts. PS. I used flask / food buff for the last 3. PPS. As of the current patch (Highmaul) i am @ 660 ilvl and thus is fairly well geared, most except staghelm is probably doable with considerably lower item level. The MapID of Firelands is 800. This is used for any WoW API function that requires a MapID. Heroic 25-man yields 2,104 gold, 75 silver, and 45 copper in 30 minutes if you sell all the loot. The trash mobs aren't worth clearing except to spawn Shannox as they only drop silver coins. I killed all the bosses with my level 100 BM-Hunter (667 ilvl). Did full clear of the top Cata Instance if you was wondering on Gold farm. These are all Full Clears on 25 Heroic. I didn't bother to add Baradin Hold, Four Winds, did them week prior they only give 200g or less. Did these as SM Fury Warrior ilvl 699.
so um i am lvl 100 and have everything set for normal and i cant walk in any ideas? Just a heads up for those scouring for gear -- Firelands is soloable. I didn't attempt Beth, as I doubted I could be in two places at once, but I might go back tonight and give it a crack. I'm a level 100 priest who's pretty much always holy, but went in as an inexperienced shadow spec in garbage gear (item level 654 for May 2016). Totally doable, not once was my health in jeopardy and I didn't have to heal up ever, so pretty easy. Trash mobs can be AoEd really fast. question? I always do Heroic 25, but I have never gotten any 391 gear? is that usual? or is 391 gear just a chance drop? I think if you go in for 391 gear into a H25 raid, it should drop 391 gear! On an average of 10 runs Firelands 25HC rewards 1519 gold, 53 silver and 73 copper after vendoring dropped gear, including trash. Can we still get to this version of Firelands since Legion dropped? Wowhead is listing a new Level 100 Firelands zone. Can we do both? Or has old Firelands been deleted? I think you may need to do the Hyjal quest chain to get in here. Went to do it today with an old Pala alt that skipped Hyjal and I couldn't get in but my hunter main has no problem. I suppose I need to get bouncing with the bears! The portal to The Firelands can be found in Mount Hyjal at the base of Sulfuron Spire. Using pre-8.0 normal difficulty lockouts in 8.0 seems to be completely broken. If you're using an alt to farm one of the later bosses, you'll have to re-clear to get a new lockout. A Firelands run (killing every living thing you could attack, bosses and trash) used to yield around 4,000 gold (selling every item to the vendor). For some reason it appears to have been reduced to at least half of that. Lately runs are pulling in around 1800 gold, which is still decent, but not nearly as good as before. Beth'tilac – Matriarca dos Teia de Cinzas, Beth'tilac e sua prole implacável alimentam-se sugando o magma e as chamas dos cadáveres de elementais. Para satisfazer plenamente o apetite da ninhada, Beth'tilac também teceu um complexo emaranhado de teias incendiárias por todo o covil, ansiando por presas desavisadas. Lorde Rhyolith – Rhyolith é um dos mais antigos elementais de Azeroth, nascido do fogo primordial que forjou o próprio planeta. Ele cuida da criação de novos elementais nas Terras do Fogo e guarda um ódio abrasador contra os titãs pela tremenda arrogância de o terem transferido. Alysrazor – Quando as tropas de Ragnaros avançaram sobre o Monte Hyjal, a dragonesa Alysra traiu os aliados e ajudou a libertar o traiçoeiro arquidruida Fandral Guenelmo. Como recompensa, a dragonesa foi purificada pelas chamas e renasceu como um temível falcão de fogo. Shannox – Os ardilantes são os mais temidos guardiões elementais das Terras do Fogo. Shannox não é exceção. Caçador-chefe e mestre do canil dos mastins infernais de Ragnaros, Shannox patrulha o reino elemental com duas feras atrozes: Ranca-membro e Face da Fúria. Balroc, o Guarda-pórtico – Balroc construiu uma reputação de combatente implacável durante as antigas guerras elementais de Azeroth. Agora, confinado às Terras do Fogo, Balroc está perdendo a sanidade. Poucos são os elementais que ousam perturbá-lo, temerosos de se tornarem vítimas de sua sede de batalha. Senescal Guenelmo – O espírito de Fandral Guenelmo ficou devastado com a perda do filho, Valstann, na Guerra das Areias Cambiantes. Agora, entronizado por Ragnaros como novo senescal das Terras do Fogo – em substituição ao falecido senescal Executus – e líder dos ardilosos Druidas da Chama, Fandral prefere ver Azeroth destruída a viver sem o amado filho. Ragnaros – Ragnaros, o senhor das Terras do Fogo, representa fisicamente a fúria e a destruição do inferno primordial em que Azeroth foi forjada. Após a oferta da oportunidade de incinerar Azeroth sem a interferência de Neptulon e Therazane, Ragnaros tenta agradar os Deuses Antigos incendiando a Árvore do Mundo de Nordrassil.